Alright, maybe a little early but what the hey! I am in SE Texas, yay year round growing season! This year we upgraded the "greenhouse" from a hoop house to a framed hoop house! Getting close to harvest for napa cabbage, broccoli, cauliflower. The newly planted raspberries are only one or two branches but are producing like crazy! The potato harvest was great, especially considering we didn't plant any this year haha. BONUS! Did you use a printed plan for the new structure or did you design it yourself? I would really like to see the plans because it would be much easier than hanging all those pie plates. I really just took out a piece of paper and went to town with a pencil and calculator to be honest. We knew the space we had to work with and just winged it, measuring all the way of course. The next step will be to hang some grow lights. 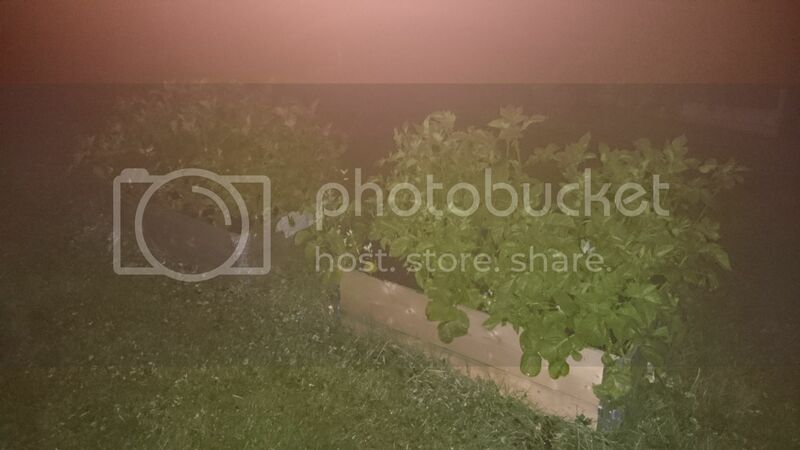 It gets really hot here during the summer and I like to garden at night. It is covered with plastic for winter (that the box SAID was clear but turned out it was white), and we are having some issues with chlorophyll fading in the plants. We may split it and make it to where we can roll it up during the day when it is not too cold. I forgot to mention, the frame is in untreated wood (didn't want to eat cupric sulfate), hurricane plates and chicken wire. 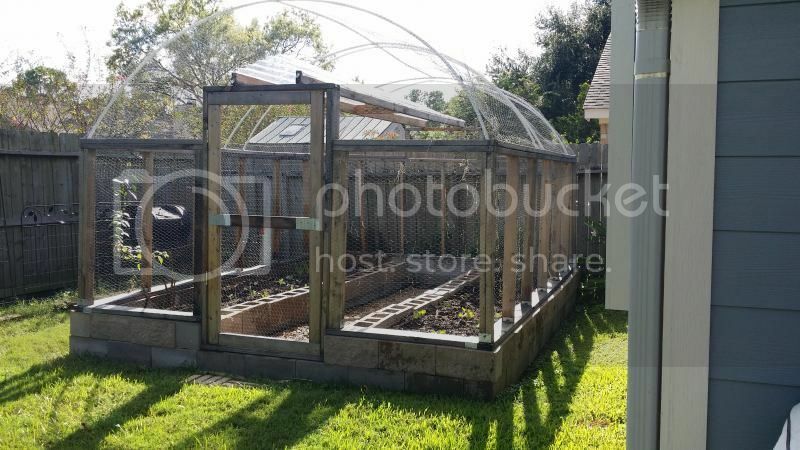 The change from plastic netting to chicken wire was a great move! The plastic tended to slump and the lawn guys loved to shred it with the weedeaters. The wire also holds up better to some of the heavier vines, for some reason our cucumbers are extra prolific here and really beat up the other mesh. Putting down a really good footing of pounded sand was really important. We have really weird alkaline clay soil that tends to stay sloppy wet for a long time and the sand helps with drainage and keeps a level surface so the bricks don't shift as much. I noticed far less shifting since we thickened the sand layer. I will be harvesting soon so hopefully there will be new pictures shortly! Yeah no need to be eating that copper, just paint the untreated wood with some good lead based enamel and you will be good to go. Wow! That looks really great . 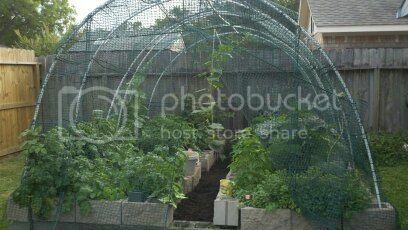 I wonder if something similar (smaller) would work for me to grow and harvest veggies in Zone 7A during the winter. Do you remove the hoops & material during the warmer months? Very nice job of gardening in smaller spaces! It must be nice to have a year-round gardening season. Here in Michigan, we have to get most of our gardening done during our summer growing season. We are lucky to have enough room for a 70' by 120' main garden and 60' by 100' second garden for sweet corn and potatoes. First year with a yard (less than 1000sqft total) here in suburbia, but I put all my seeds in a planter tray, expect sprouts to pop up in about a week or two; then move the planting tray in the sun! 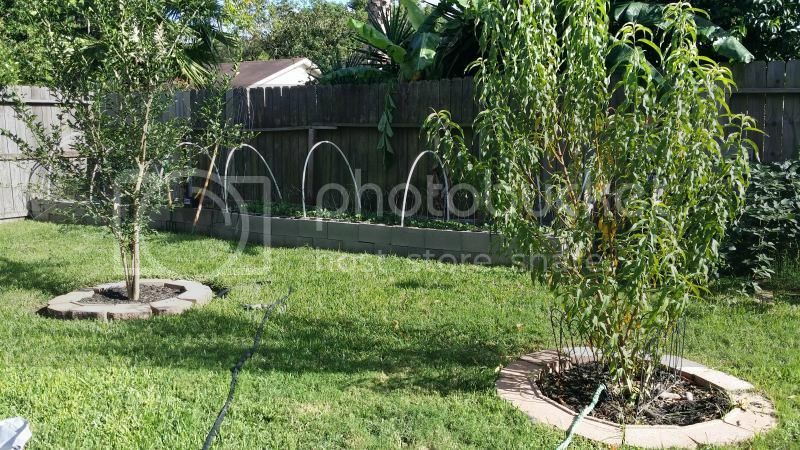 Will be doing about a 6ft by 8ft square planted garden, with tomato plants placed around the yard. Will be interested to see how everything grows. First year, lots of learning. I searched, and I think I found my answer as no, but, can you grow sweet potatoes/yams vertically like you can potatos? We don't eat potatos but love sweet potatos. Has anyone tried it? I keep forgetting to take pictures while I'm back at the homestead. This year I'm putting in several more trees and shrubs. I didn't get near as much seed stratified as last year, so in total numbers I'm putting in way less but they're bigger since they're either bare rootstock or in containers. From what I planted last year the apples all seemed to do fairly well. It looks like a moose bit off the top of my selkirk crabapple but I think it will turn out fine, just a little bushy. The siberian pea shrubs I planted also look good. Everything else I started from seed last year hadn't budded out the last time I checked, but I haven't completely written them off as dead yet. The comfrey I planted from cuttings is up. The jerusalem artichokes aren't. This year I'm starting Maximilian sunflower from seed, rhubarb from seed and currant from seed. I already managed to kill the first planting of rhubarb. The currant is still stratifying in the fridge. The maximilian sunflower had started to sprout in the fridge so I planted it in a seed starting tray today. I didn't start stratifying early enough so most of my seed is going to hang out in the fridge until next year. I've got thirteen grafted apple trees to plant this year. Four of them I grafted myself, but one of them has no buds above the graft. I bought nine more. I also have fifteen hybrid hazelnuts on order from Badgersett. I had a small refrigerator stuffed full of currants and honeyberries in pots to winter them over. It looks like about twenty of them made it. I'm also planting small amounts of raspberries, service berries, apricots, gooseberries, horseradish, hardy kiwis and asparagus. This isn't counting the ornamentals and medicinals, or the various things my relatives are planting at the homestead. I got a late jump but I planted seeds about 2 weeks ago in my containers. Green peppers were the last to sprout this past week. All the others are 8-12 inches tall and already past their first leaves. Last year I only planted 2 containers with cucumbers and was getting about 5# a week for about 8 weeks. Insane production imo. I made bread and butter chips and dill chips last year and they went over well at the picnics I took them to so that is the plan again this year. A bit jealous of the hoop house. I had some potatoes going good...moles got to them, at the seed potatoes/roots of about half of them. Also, it's dark here. Probably something to do with the fact that it's 11pm. 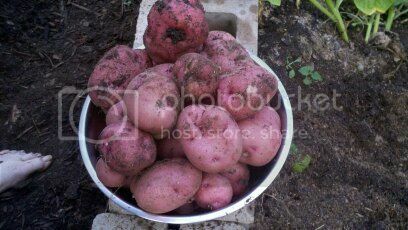 Langenator wrote: I had some potatoes going good...moles got to them, at the seed potatoes/roots of about half of them. The moles eventually ate all the potatoes (yukon golds). For some odd reason, they didn't touch the sweet potatoes. Ended up with about double what I needed for Thanksgiving dinner.